The functionality of voice search is still something that many casual internet users haven’t opted to use. While more and more mobile devices in particular make it easy, the technology is still somewhat rudimentary and will take some more time before it is truly commonplace. Voice searches can be a convenient way to quickly obtain info without distracting yourself behind the wheel or when you otherwise have your hands full. As technology continues to evolve, so will the capabilities of voice search. We’ll review what changes can be expected in the coming years and what you need to know in order to be prepared. Imagine a search engine that recognizes you not just by the device you’re using or the account you’re logged in with, but that actually recognizes your voice in a sea of billions. This type of voice search recognition is already beginning to take hold in a variety of private and smaller environments, but it’s only a matter of time before search engines are pinging users and listening for specific vocal matches. This will allow voice searches to be customized and personalized – regardless of where you are or what device you’re using. Tied into this is the possibility that voice itself may become the primary authenticating factor for logging into Google and other services, meaning that passwords could be a thing of the past. As of now, voice searches do not take into account how someone is feeling. This is largely because the technology does not exist on a wide enough of a level to be feasible for the masses. In the coming years, however, expect major search engines to focus heavily on analyzing tone and mood via voice searches. The information collected in such interactions will prove to be very useful to search engines in various marketing efforts along with showing relevant ads. Search engines heavily emphasize context and are trying to refine their algorithms to determine such with every search. The ability to discern emotion in voice searches will put them one step closer to producing a truly unique, relevant and customized experience for each user. Currently, voice search has a long way to go in order to catch up to standard text-based searches. Most search engines can infer intent from a combination of words that are typed out, including misspellings, slang terms and other variables. With voice search, that has yet to become entirely true, but it is only a matter of time before search engines will be pinging users and databases alike in order to determine the intent behind spoken queries. Ultimately, this dynamic will lead to even greater adoption of voice searches – as the current technology still remains a bit clunky and not universally functional depending on accent, tone and broader speaking style. From a simple user perspective, voice search will continue to become more innovative and intuitive as time goes on. 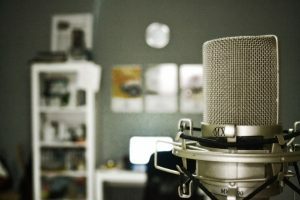 From a brand perspective, this niche will increasingly become competitive, with more and more companies trying to optimize their rankings for voice searches specifically. Only time will tell how mainstream voice search and commands will become, but the trend as of now is very clear.